The news this week from Personnel is partly from last week too, for this reporter was "slightly indisposed" last week and unable to get out a copy. O.Z. Parker and Judy Tennyson left us more than a week ago. Mr. Parker is transferring to the U. S. Engineers and will probably be located at Dawson Creek, British Columbia, on the Alcan highway. Mrs. Tennyson left to be with her soldier husband who is located at present in Minneapolis, Minnesota. Mrs. Blanche Hawkswood returned to Personnel, March 15th, after being absent more than a month caring for her mother in Boise, Idaho. She has taken over the work left by Alma Hayes. Nelson of Personnel was re-christ-ened last week as old "One Shot-Two Days. If interested in the actual result of 10 shrinkage in garments, check Burkhart of Personnel. Joy Eberly received a letter last week from Alma Hayes, who is at the Ammunition Inspectors' school in New Jersey. Miss Hayes says that she is really busy and has to burn the "midnight oil." Did a slight over "wearing of the green" cause the frequent raids on the water cooler by members of Personnel and Identification a week ago Thursday? Leona Nolan spent several days last week at her home in Belle Fourche. Bettie Lou Furness of Boise, Idaho, is a new member in Personnel. Our good luck was abetted by Mrs. Hawkswood, who brought Bettie Lou back with her. Spring duly arrived in Personnel last Saturday with a rush of furniture moving and rearrangement, with Captain Lockett acting as chief housekeeper; the new arrangement is hoped to make for more efficient handling of applicants for positions with the Ordnance and Post Engineer Departments. Mr. Purcell reports that the 19 men brought from Omaha last week are now outfitted and, according to the reports of their foremen, are working out very well on the job. Mrs. Martha Hayes is a new member of Personnel. Mrs. Hayes, who is now working in Personnel Records and Reports Section, was formerly located with Depot Property. One of the big questions in Personnel in the past two weeks has been "Who was the red-headed Marine who called on Monica Hand May 15?" Irish, too, we suppose! Mr. Purcell had to leave the office late last week to take his wife to the hospital in Hot Springs. We are happy to report that it was not necessary, as was at first thought, for Mrs. Purcell to undergo a major operation. Jo Eberly of Personnel reports that one of the advantages of living in Edgemont is that she is now catching up on a lot of lost sleep by taking a nap to and, from work. Mrs. Myrtle Conger of Personnel is taking a few days annual leave. Marie Connole of Personnel, who visited Camp Robinson over the week end, reports that she never saw so many horses and dogs in her life. Blanche Hawkswood spent the weekend in Rapid City, reportedly having her eyes tested. Betty Lou Furnis, who also spent the weekend in the above city, reports seeing lots of animal on the way. Faye Telford trucked to Rapid City this weekend to get her eyes tested. Hmm - - to see those handsome men better, kid? Say, we'd like to see more of Capt. Lockett than we have been. He's been in and out of our office so much the girls are acquiring stiff necks from watching him. Lola Powell went to Custer this weekend. Oh, yes! Mr. Nelson is still reciting his philosophy of life to all of us. And he a former schoolteacher. The Edgemont Tribune; Feb. 7, 1944; The Personnel Office is a gateway for employment in all parts of the depot. Every person who has been employed at the Black Hills Ordnance Depot, regardless of the type of job, started at the same place - personnel office. For this reason, every one employed at the Depot knows there is a personnel office; but it is doubtful if any person not connected with the office realizes the details of work and responsibility connected with the direction of a well-rounded program for the effective administration of personnel problems. The Personnel Division is one of the six divisions as set up according to the organizational chart approved by the Chief of Ordnance. This division is responsible for matters pertaining to military personnel such as assignments transfers, leaves, promotions, and efficiency reports. Recruiting, interviewing, investigating, classifying, appointing, promoting and terminating of civilian employees area all carried on by the Personnel Division upon recommendations of the chiefs of other divisions, and with the approval of the Commanding Officer. Personnel: Supervisor, Jack Lanter; Minute Men, Military and Civilian Personnel Branches, Joy Eberly; Medical Branch. Pictured here is the staff of the Black Hills Ordnance Depot Personnel Office. Lois Hagen, Miriam Buckley and Monica Hand. Although most of the people at Igloo have had contact with the Personnel Office at one time or the other, the actual mission of that organization is not as widely known as it might be. The Personnel Office is the first official business of people obtaining employment at BHOD. It is also the first official business of those who terminate their jobs and leave Igloo. Between hiring and termination there is a vast area of business that the Personnel Office accomplishes that is much less known. The mission of the Personnel Office covers the field of recruitment, training, employee evaluation and internal placement, setting up standards of performance and employee utilization. Beyond recruitment the job of this office is advisory, giving assistance to line supervisors and management in employee relations. The job of recruitment is a large one. All vacancies within the installation must be filled through the agency of the Personnel Office. The Placement clerk, until recently held by Bob Cox, takes the brunt of the recruitment job. During the year 1951, over 1,200 individual hires were processed by the placement person. Hiring this many people may involve as many as 1,700 individual interviews. Indispensible to the agency hiring and placement program is the board of the Civil Service Examiners of which Edgar Hall is the Executive Secretary. Monica Hand accomplishes much of the Boards activities. Lists of elgible applicants are provided the agency for selection for placement in the various vacant jobs at the Depot by the Civil Service Board. As many as 15 Registers of eligibles are maintained under various Civil Service announcements. Edgar Hall is also Chief of the Employee Utilization Branch of the Personnel Office. This Branch provides supervisors assistance in filling vacancies by promotion of qualified Depot employees. The program of placement is the prime importance to the personnel program. Over 1,000 placements by promotion was made during the year 1951. This amply attests to the success of this Depot's program of making use of skilled persons already employed here. Assisting Edgar Hall in the work of this branch are "Speed" Deimer, Bill Granberg and Miriam Buckley. Indespensible to a successful internal placement program is the recently established Training Officer, "Syd" Finkel. He works with supervisors to determine where training need exists, set up an appropriate training program, and assay the results. By training the people already employed at the Depot, initial skills can be further developed, and beside apparant advantages to the trained employee, the Depot benefits for having more efficient employees, higher morale and reduced recruiting factor. Responsible for preparing job descriptions and assisting in the allocation of job levels is the Salary and Wage Branch. Don Waldron, recently replacing Frank Berget who went to the Management Office, heads the Branch. Bob Cox, upon his return from Rock Island, Illinois, where he is presently in training, will assist Don Waldron. Also part of the job of the Salary and Wage Branch is that of assisting in the locality wage survey and getting proper wage adjustments in the Wage Board (per deim) jobs. Dorothy Callahan is the Clerk Typist for the Branch. Vital to the successful accomplishment of the "Job on paper" of the Personnel Office is the Administrative Branch headed by Mrs. Elsie Nafziger. Assisting her are Agnes Johnson, Lois Hagen and Mavis Backer. Responsible for the Personnel Office is Cliff Kuhnke, Civilian Personnel Officer. 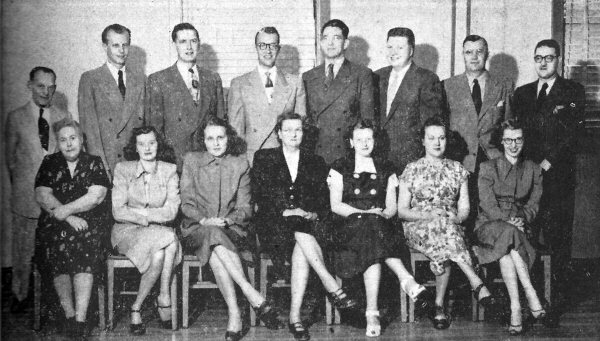 Cliff came to Igloo from Pueblo, Colorado in 1950, and besides the effective management of this office, he is Custodian of the Civilian Welfare Council. Hiring of men on a limited scale was begun this week according to Edgar Hall, Civilian Personnel Officer. Twenty-two have been hired raising the depot ungraded strength to 958. This figure will be maintained by hiring to replace resignations and other separations, Hall disclosed. No women will be hired for laboring work according to present plans even though there may be some resignations from women now employed in the Storage Division. The Civilian Personnel Officer cautioned employees against advising friends and relatives of any large scale needs. He said applicants, especially non-veterans coming here expecting to go to work immediately may be disappointed as new hires will be made only when resignations occur. "The best bet", he said, "is to submit by mail a completed application blank, Form 60, to the Personnel Office." Blanks are available at any first or second class post office. Word has been received from Miriam Buckley, a former employee of our Personnel Office, that they are happily located at Camp Carson, Colorado. Miriam is working for C. H. Kuhnke, Civilian Personnel Officer, and her husband has accepted the position there of Chief Inspector of the Canine Corps. Col. Paul N. Wickens, Depot Commander, announced today that a wage survey had been made by the Salary and Wage Branch of the Personnel Office. The Depot Commander said the purpose of the survey was to determine the amount, if any, of wage increases given by private employers in the locality since August 1952, when the last complete survey was made. A request for a review of the WB and WBS local wage had previously been made to the Army Air Force Wage Board in Washington, D. C., by Black Hills Ordnance Depot. A telephone survey was authorized as a quick method of determining any significant changes in the local wage structure. A short list of private employers, whose wage structure greatly influences this Depot's rates, were compiled by the Board. These employers are located in Rapid City, Lead, Belle Fourche, Newcastle, Edgemont, and Crawford. The data gathered will be submitted to Washington. The Army Air Force Wage Board will determine whether or not there has been sufficient changes to warrant an adjustment in the local Wage Board and Wage Board Supervisory pay schedules. There will be no change in GS pay schedules as these rates of pay are set by Congress. Colonel Wickens said it was impossible to say definitely when a decision and reply from Washington could be expected. He did express the opinion however, that it would take at least two months. The Army Air Force Wage Board has also informed the Depot that a full scale locality wage survey for this area would be scheduled sometime after November 1, of this year. Any increase received before that time will be considered in computing new rates after the regular survey. The Colonel emphasized that the regular wage survey would be accomplished regardless of any change in the pay schedule, as a result of the telephone survey just completed. Depot Wage Board employees were pleasantly surprised Monday when it was announced by Depot Commander Paul N. Wickens that a pay increase would be effective September 27. The adjustment was a result of a request by the depot earlier in the summer for a review of the WB and WBS local wage schedule. A telephone wage survey of a short list of private employers in the Hills area, whose wage structures greatly influence the depot's rate, were obtained by the Ellsworth Air Force Base and BHOD Personnel Offices. The new pay rates were received early this week and will be reflected in Storage Division paychecks received October 16. All other employees will receive the increase in the pay check received October 23. In both cases, computation at the new rate will be made by the Payroll Office beginning September 27. Shift differentials are the same as previously, four cents for the second shift and six cents for the third shift. Although the Army Air Force Wage Board has indicated the Depot will be subject to a full scale locality wage survey sometime after November 1, 1953, the current increase was granted to give immediate relief. The present increase, which averages four cents per hour, will be considered in computing new rates after the regular survey. Affected by the pay schedule, in addition to BHOD, are; Ellsworth AFB, Black Hills National Cemetery and Resident Engineer Office, CE at Rapid City. Less than six percent of the total Depot personnel will be effected by the reduction in force at BHOD and distribution of letters to those effected was completed today, according to Ed Hall, Personnel Officer. Hall said that in most cases those persons receiving letters would receive offers of other jobs, many in the Storage Division, and that the letters would automatically be cancelled if the jobs were accepted. The Post Engineers were hardest hit by the cut with 63 employees receiving letters. Jobs were abolished effecting six employees in the Maintenance Branch and five employees in the Transportation Branch. Nearly all male employees will receive an offer of continued employment in some capacity. An additional twenty five letters of reduction in force were given female employees in Renovator WB five and six jobs and Processor WB three jobs. RIF letters to women were necessary to keep the overall Storage Division strength down to its present level when some RIF'd males are reassigned to Ammunition Renovator jobs. The Civilian Personnel Officer said those affected by the RIF who have indefinite appointments would be the ones primarily placed in Ammunition Renovator jobs. "It is quite possible", Hall said, "that some of the RIF letters to women will be recalled". We don't know for sure how many men will accept renovator jobs in lieu of separation. It may be that less than 25 men will be placed. In announcing the depot's policy of laying off women workers to place men who otherwise would be out of work the CPO said, "it was part of the Depot's continued effort to provide employment for as many families as possible by keeping the husband on the roles." He also pointed out, "it will permit the depot to retain male employees who have skills which can readily be put to use should a sudden emergency call for rapid expansion as was necessary in 1950." A representative of the South Dakota State Employment Service will be at the Community Building from 1:00 p.m. to 9:00 p.m. tonight to assist workers who have received RIF notices in securing private employment should they not desire to continue working here in some capacity. Continued hiring of women seemed imminent today according to Ed Hall, Civilian Personnel Officer. Based on estimates of man-power needs for the next five months, Hall said about 75 women would be hired in the Renovation Branch of the Storage Division. Hires will be for a period not to exceed 30 June 1955. The 75 figure is in addition to the 20 put on this week. Selections from the list of eligibles maintained by the Civil Service Commission will be made by Storage Division personnel, Hall said, according to Civil Service selection procedure. The Personnel Officer pointed out that such procedure does not guarantee an eligible a job. Each position is filled upon the merits and qualifications of the persons considered. Not all 75 women will be hired at once. According to present plans, 68 will be hired within the next two weeks. Additional workers will be put on after the R&D Branch is able to absorb them on new shifts and lines. According to present production estimates, the women hired will not be employed beyond 30 June of this year, and some may be laid off before that time. The Personnel Office announced plans were underway to hire an additional 25 men for Munitions Handler jobs which will not last longer than 30 June 1955. Applications for these positions are not being accepted at the present time as the Civil Service Commission still has a list of eligibles to take care of all anticipated needs for the next six months.